Tram line 22 at stop Arkady in Wroclaw. Wikipedia photo by Nillerdk (May 30, 2009). The ERA is proud to announce its 8th international tour. During nine days of travel, Tramways in Poland will cover 10 tram systems, extensive interurban networks in Lodz, Krakow and Lower Silesia, a suburban light railway and a subway line of Russian design in Warsaw, two transportation museums, a trolleybus network in Gdyna, and a S-bahn system in Gdansk. We will explore each city utilizing a variety of historic or unique vehicles. There will be an option to visit regular service Poznan-Wolztyn steam railroad, as well as an option to spend the tenth day in Wroclaw, formerly Breslau, which has a lovely tram network and a tram museum. 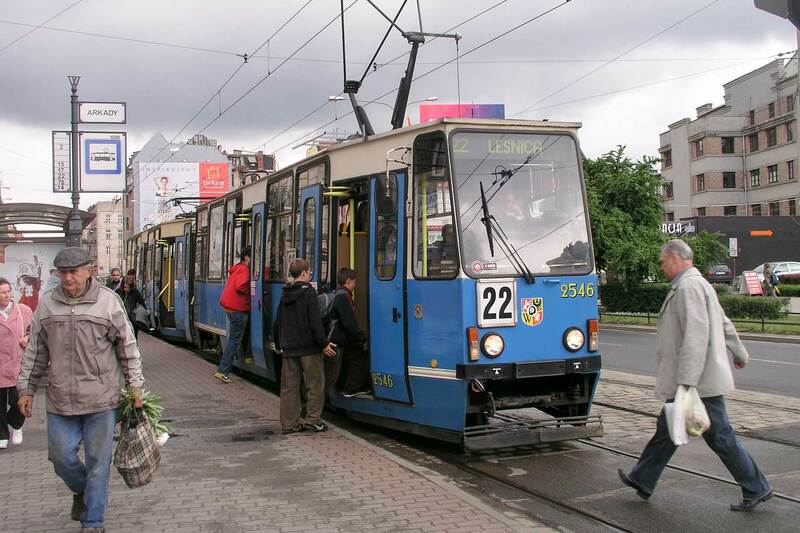 Polish tramways constitute a diverse assortment of urban, rural and interurban traction, century-old lines through old historic districts, dilapidated trackage in formerly influential industrial areas, as well as modern high-speed lines. These are roamed side-by-side by various local equipment (most of it of PCC origin), renowned second-hand equipment from Germany, Austria and The Netherlands, modern low-floor LRVs and prehistoric 2-axle trams. Each city maintains its own historic fleet of Polish, German, Austrian or Belgian cars, some of them from the turn of the previous century. Poland is a large country, thus, in order to optimize our program, we will be staying in three consecutive hotel bases in Warsaw, in Elblag in the north, and in Katowice in the heart of Silesia in the south. Hotels were carefully chosen to provide a blend of comfort and convenience. Hotel transfers will be by comfortable intercity buses, which will provide door-to-door service between hotels, as well as an opportunity to visit additional tram systems while traveling between our bases. As we make stopovers, our luggage will remain on the bus at all times. All other intercity travel from and to our hotel bases will be done by PKP Polish National Railways. The formal part of the tour will begin in Warsaw on Saturday, May 20th, with a late afternoon tram excursion. The last excursion will take place in Krakow on Sunday evening, May 28th. Our hotel in Katowice will be paid for until check out time on Monday, May 29th. A return to Warsaw will be by individual choice (frequent express trains departures). International flights are also available from the Katowice-Krakow airport. Twin-bedded rooms at 3-star hotels: Holiday Inn hotel in Warsaw, centrally located just 300 meters from the main railroad station; hotel Viwaldy in Elblag, located in the heart of the old town; and hotel Silesia in Katowice, central location, 500 meters from the main railroad station. Breakfasts at all hotels are included. Group travel on PKP Polish Railways and bus transfers by high comfort buses between hotels. Welcome dinner on the first day in Warsaw and lunch or dinner on each day of travel. Air transportation is by individual choice. Orbis Polish Travel Bureau working closely with the LOT Polish National Airline is recommend: 800-876-7247 or 212-867-5011. In January a round trip ticket from New York to Poland was quoted at $880 including taxes. Other suggested carriers: Lufthansa 800-645-3880 quoted $960; United 800-241-6522 quoted $905 using Lufthansa equipment; Finnair 800-950-4768 or 212-499-9000 quoted $732. For questions call 917-714-7087 or use our Contact Us page.